Outside of some vendors and startup companies, the IT job market is flat and has not responded as well as the rest of the U.S. labor market. 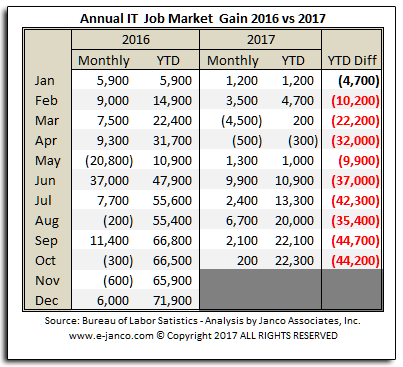 The total number of new jobs added still trails the growth seen in 2016, with only 22,300 net-new jobs created in the first 10 months of the year, versus 66,500 last year, according to Janco Associates’ latest IT job market forecast. It’s based on its analysis of October data from the U.S. Bureau of Labor Statistics. “Our forecast is that IT job market growth for 2017 will be the lowest it has been in the last four years, with just over 34,000 new IT jobs created,” said Victor Janulaitis, Janco‘s CEO. The number of IT jobs has been impacted by the “devastating effect” of multiple hurricanes and fires, and the feeling by many C-Level executives that tax reform may not occur this year, he said. 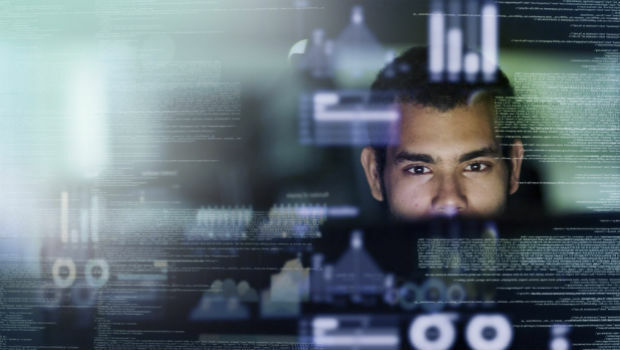 Non-IT based companies are keeping IT staffing levels flat, Janco said; however, software and hardware organizations are actively recruiting. Spending on mobile devices, data center and software will go up while telecom spend will remain flat.